La Collection de Grasse is a new quartet of fragrances from L’Occitane, and something of an introduction, perhaps, to the house's newly announced in-house perfumer Karine Dubreuil (although she has developed fragrances for L'Occitane in the past, including Eau des Baux, L’Eau des 4 Reines and Myrte from the Notre Flore collection). Today, reviews of Jasmin & Bergamote and Magnolia & Mûre; coming up on Thursday, Vanille & Narcisse and Thé Vert & Bigarade. I was not entranced, but if most jasmines are too much jasmine for you, or if you need something office-friendly or otherwise casual, it is worth a try. Expect to reapply, possibly more than once, if you need all day coverage. If you need a light jasmine but want just a bit more floral oomph than this, try Annick Goutal Le Jasmin or Ineke Poet’s Jasmine. If you like your jasmines tame, you might also try Acqua di Parma Gelsomino Nobile or Jo Malone White Jasmine & Mint. If you'd like less oomph, more clean, try Guerlain Jasminora. And as always, feel free to share your own favorites in the comments. I did not expect to love this one, not being a massive fan of berries in perfume — and I didn't, in the end, love it — but this sweet fruitchouli slash berry musk was livelier and more fun than I expected. A streak of tartness in the opening keeps it from descending straight into cloying; there is as much rose as magnolia in the heart (I rather wish they'd done a Magnolia & Bergamote, good magnolia-centric fragrances being so hard to come by). Perfumistas will probably not find it all that unusual, but it's a pleasant enough rendition of a familiar theme and it does have more presence (and staying power) than the Jasmin & Bergamote. I am a bit surprised at the price, as I often am when I shop at L'Occitane — as I've said before, everything always seems priced a bit higher, or sometimes much higher, than I think it is worth. These are also a tad higher even than the Guerlain Aqua Allegorias (those are still $63 in the US, although of course you can also find them considerably cheaper at discount stores). 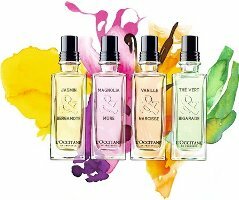 The sale price for the L'Occitane travel coffret qualifies as a cheap thrill, but bear in mind that these are generally at a concentration where you might run through 7.5 ml rather quickly. Hi Robin, thanks for your reviews of two new L’Occitane scents. Actually I’ve been just exchanging comments with my readers about these scents and we were thinking if they’re worth the curiosity or not. Seems like neither of these two will find a place on my perfume shelf. It will be interesting to see if they do better than the Notre Flore, which I didn’t realize until now were nearly the same price (probably the same when you allow for the difference in years). Those were better than these, IMHO, but also thought those too expensive. Thanks for the review, Robin. I look fwd to your review of the other two. 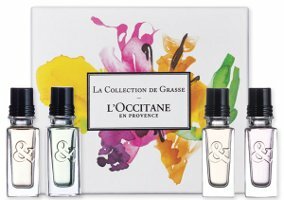 Not much about this series excites my curiosity, though I consider myself a L’Occitane fan in general (maybe less so with their recent offerings?). That set of four is so CUTE though, and I love the box. And marked down to $30? Wow. The one I’m interested in is the narcissus scent, as I love that note, but I’m not expecting much from it in any case. I’m surprised to know that the Aqua Allegorias are only $63. I think I used to be more of a fan than I am now…again, that might be because of the pricing, which I think has grown more & more out of line with the products, especially in comparison with what you can find at other mall chains, like Lush & The Body Shop. But the Narcisse is definitely my favorite of these 4. Mind you, I would not pay even $63 for an Aqua Allegoria, but then, with those you generally don’t have to pay full price…the few I own, pretty sure I paid closer to half that. I’m happy you’re reviewing them, because I’ve had on my to-smell list for a while, but so far, I didn’t manage to get the nearest L’Occitane boutique. I wondered how Jasmin & Bergamote compared to Voyage en Mediterranee Jasmin, which was created by Dubreuil as well, and it seems like it’s much fresher and cleaner. Aren’t you all expecting a bit too much from L’Occitane? Oh, quite possibly! But they raise expectations as they raise the prices, IMHO — they’re sort of asking for high expectations. Yeah, and they have that sort of Aveda-esque pseudoboutique feel about them–trying to seem like more than a mall chain. Speaking of which, wonder what happened to Aveda’s perfume line? They haven’t released anything new in ages. Sounds like I need to stop by L’Occitane to give these a sniff. The coffret at $30 is attractive. Probably won’t last long but good while it lasts. Seriously, there are way worse ways to blow $30. I do think the $46 is less tempting. I bought SL Nuit de Jasmin after you endorsed it in an earlier post comment, and just love it. It really is like walking outdoors at night into a garden with jasmine in bloom. It is such an incredible scent, really don’t know if anyone has beat it for jasmine. Keep waiting for Frederic Malle to try! These sound very nice though admit the one I have my eye on is the Narcisse one so looking forward to your review. I’m not a jasmin soliflore type though I do love by Kilian’s Love and Tears and the Bruno Acampora Jasmin. L’Artisan’s The pour un Ete is gorgeous and I love love love the jasmin in vintage Diorella or Parfum du Therese. Hahaaa I guess I like jasmin in perfume more than I thought! I do like the hand creams, and they used to make incense cones, don’t know if they still do — the green tea ones were pretty nice. Thank you for sharing your thoughts on these. I guess I’ll pass on them. I might like Jasmin & Bergamote, but there are plenty of jasmine scents out there and this one doesn’t sound like one I need to make an effort to track down. And what a shame that Magnolia & Mûre didn’t focus more on the magnolia. Magnolia is one of the most beautiful scents in the world, in my opinion. Agree about magnolia, although have yet to find a magnolia perfume I completely adore. I’ve been debating a trip to the mall-not-so-close-to-my-house – there’s a L’Occitane there, and these new scents might make a sniffing excursion worthwhile. That, and I’m getting low on my hand cream, which is simply The Best There Is. I just bought a small tube of the honey shea, although don’t love the scent as much as I hoped. The mango is surprisingly nice. Grrrr, the coffret was out of stock at the Grand Central store. But did I leave empty-handed? Of course not :-). I ended up getting the Eau des Baux since I had been eyeing it for a while waiting for a nice gift and the opportunity presented itself. The gift with purchase included a mini of the Jasmin & Bergamote and body lotion in the same scent (will give away as a freebie since I don’t use scented body lotion). Of the 4, I liked Magnolia & Mure the best but did not want to commit to a 75 mL so I ended up with the Shower Gel instead. The Vert & Bigarade smelled too much like The Vert which I have an love so no need for this one. The Vanille & Narcisse was just OK, nothing special. The Jasmin & Bergamote smells fine as long as I disassociate jasmine with mothballs. The coffret at $30 is still available online so I decided to order it, reed diffuser sticks and a Bonne Mere soap since it was free shipping with a $40 purchase. Glad you found the coffret online — nice haul!